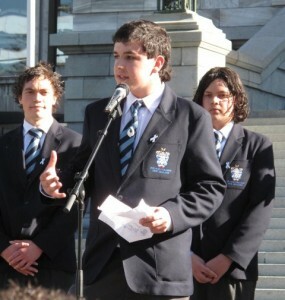 Johny O’Donnell, a leader of Students Against Violence Everywhere (the SAVE Movement) gave the following speech on Parliament Steps last Thursday. 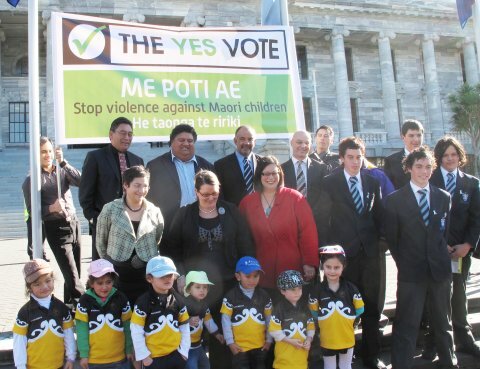 I stand before you today to represent the views of the many rangatahi up and down Aotearoa who are calling on adults to vote in support of violence free homes. I stand with just three of our group of passionate rangitahi who have joined the Students Against Violence Everywhere youth movement and are dedicated to making a difference to our society. There is a gap in our society and it is youth opinions. Perhaps the government and everyday citizens would be better informed if youth get a better say, I think the referendum is a clear example of young people’s rights and opinions being overlooked. This law is the difference between us having equal rights to be protected from violence or having less rights than adults and animals. So this issue is a very important topic for young people, surely we would get a say in this issue. Our rights to be brought up in violence free homes are being threatened by groups who are only thinking about adults and it disgusts me that these people are ok with our children being brought up on violence as a form of discipline. As quoted by SAVE member Manaaki Walker “Violence is a ripple effect. It starts off as a drop in the water but soon creates a ripple effect which disturbs all the waters. This is no different than smacking a child. It may start as a smack but can trigger other violent behaviours from both the parent and the child. We need to keep our waters calm and let children have peace in their own homes”. Smacking is violence and it is harmful, we need to make change to our parenting methods. I want to be a part of a generation that eradicates all forms of physical punishment because it is ineffective, unnecessary, harmful to children and a mind set of some kiwi parents that this is the only option. This law is about positive change and it is happening, good parents are not being criminalised and our attitudes are changing. Child abuse is no longer excused because of discipline. In a recent survey held on the SAVE movement website 69% of youth voted yes to the question Should a smack as part of good parental correction be a criminal offence in New Zealand? 69% of our young people are urging adults to take this opportunity to do the right thing – be the voice that we can’t be and speak for us. This question was one of many questions aimed at canvassing young peoples opinions and 100 people from as young as 10 years old participated in our online survey from all around New Zealand. We also asked should there be the defence of discipline in child abuse cases? A clear 81% of youth said no. Further that 82% believed that young people deserved a better say on this issue. And when asked what best describes the referendum question 45% of participants said it was absolutely shocking and shouldn’t be allowed, while 24% said it was not very good and miss leading. Just 8% thought that the referendum question was excellent. So lets clear this up once and for all young people of this country are calling for people to vote yes and I am only echoing that call. The time has come for people to listen to youth opinions and protect our rights to be free from all forms of violence including physical punishment. I can only ask that you do the right thing and speak for us- physical punishment is harmful, it’s a waste of time and can only encourage other forms of violence- there is no line between a smack and other violence- the whole lot of it needs to be gone from our homes. Lets not put this change under threat please vote yes in the referendum. A survey of 5263 children has found the majority believe parents who are taken to court for hitting a child should not be let off if they say they were disciplining a child. 52 percent of children said they don’t think adults should be let off. 39 percent said adults should be let off and 9 percent were not sure. “The views of those who participated in the survey on the child helpline 0800Whatsup, show a range of opinion among children and young people. The majority of comments were in favour of the current law and some callers stated explicitly that parents who hit children should themselves be disciplined for doing so,” said Murray Edridge, Chief Executive of Barnardos New Zealand. “Similarly, with research showing there are positive trends away from the use of corporal punishment, a ‘yes’ vote is an expression of support for parents’ choice to not hit their children. Positive, non-violent, parenting is more effective than corporal punishment as well as supporting better long-term outcomes for children and for society. This is something we should all say ‘yes’ to!” he concluded.